People who love to create things—whether it’s art, food, music or by writing—are my favorite kind of people. My friend Leila, an American artist, poet and photographer living in Okinawa, Japan, who I “met” through doing this blog, is one of those kinds of people, and I’m so happy to have a connection with her! After sending me a huge box of Okinawan goodies late last year, she kindly sent me another product from the island called fu, which is a sort of dry-baked wheat gluten. I have never seen or heard of this product anywhere in the states, so I was eager to try it out. 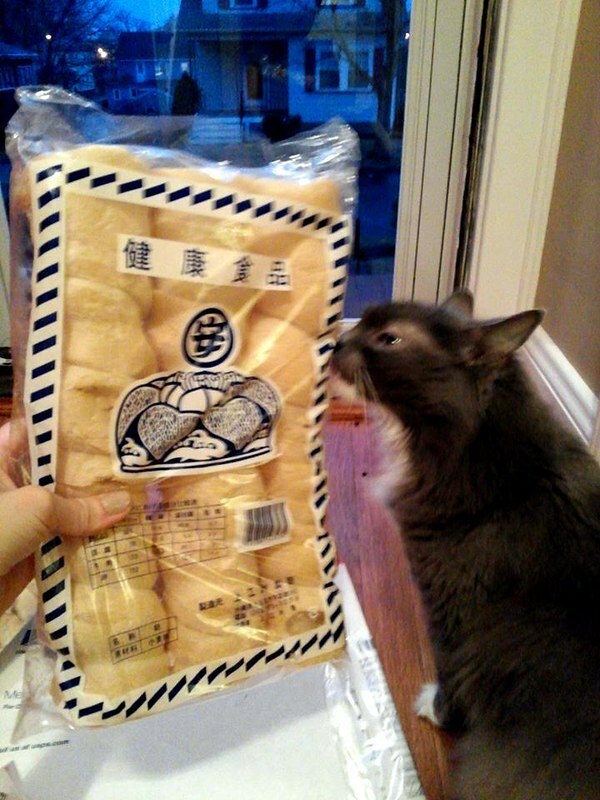 The package Leila sent me included three types of fu: one that looked like croutons or sliced mini baguettes (yakifu), one that looked like dehydrated slices of tofu (shounaibu) and one that looked kind of like a puffy pastry with a hole in the middle (chikuwabu). I think I got these terms right, but am glad to be corrected if they are not! I decided that I wanted to use the shounaibu first. It came in a package of eight, 2 1/2 X 2-inch pieces that were deceptively light and fragile-looking but impossible to snap off into smaller pieces. After a little research (there’s not much to find online), I reconstituted the fu in some hot broth, which completely softened it without expanding it in size. I took a bite, and it had a definite dense and meaty texture to it, but featured no real dominant flavor. Since this product was so new and delightfully strange to me, I decided I would do what I usually do when I’m not completely sure how to use an ingredient: I deep fry it. The results were fantastic: the cornstarch and sesame seeds gave the outside a crispiness that worked well with the meaty-textured fu inside, while the sauce enhanced and rounded everything out with a little sweetness, sourness and saltiness throughout. 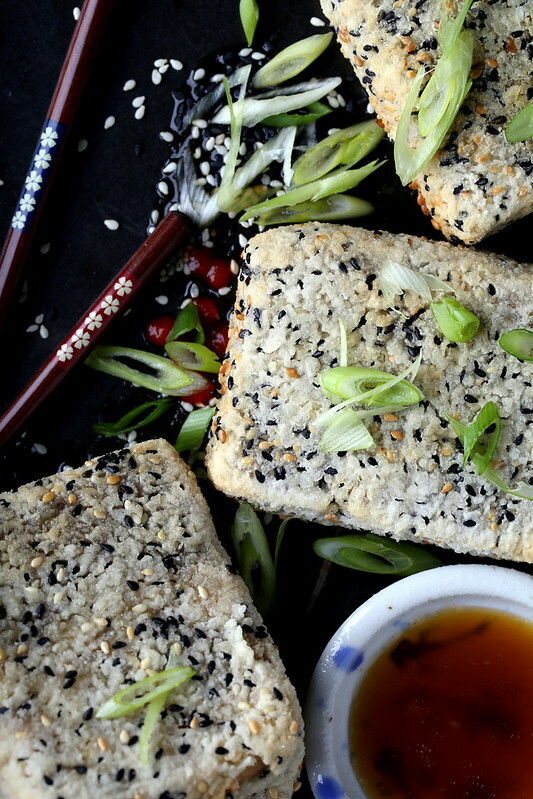 If you can’t find fu where you live, this method would also work with unpressed tofu, seitan, thinly sliced sweet potato or steamed tempeh in its place. This was perfect served alongside some wilted bok choy, although collard greens or broccoli work work as well. 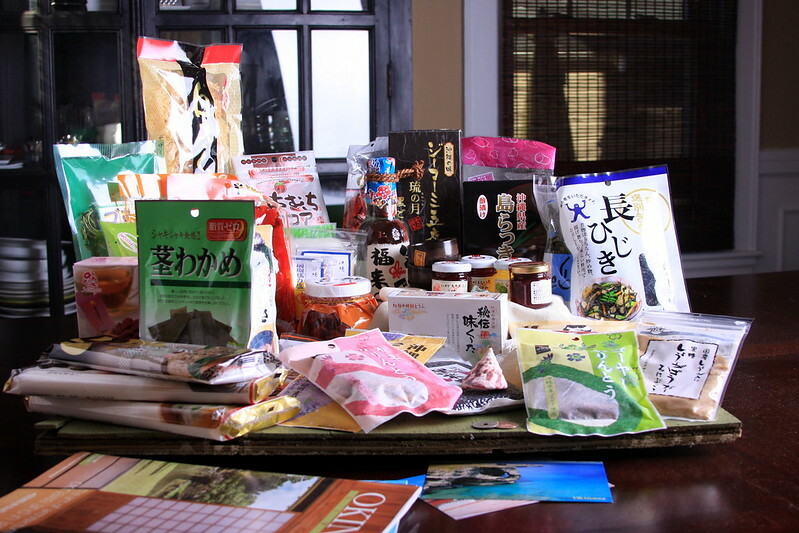 Thank you again Leila for the kind gift, your wonderful friendship and introducing me to these Okinawan ingredients! Bring the broth, soy sauce and sesame oil to a small simmer in a saucepan wide enough to submerge and mostly cover the fu. Drop in the fu and allow to soften for about 10 minutes, flipping it over to ensure all sides are saturated. 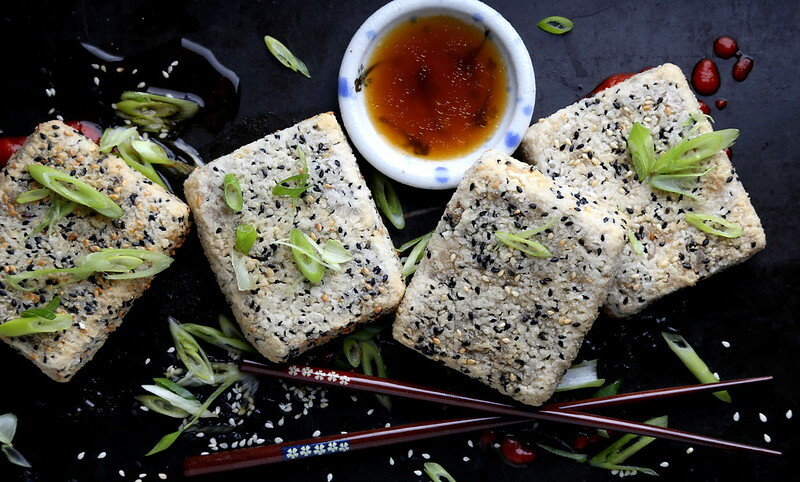 While you are soaking the fu, combine the cornstarch, sesame seeds and salt in one bowl. Whisk together the Ener-G and water in another bowl. Fill a small saucepan with a few inches of oil and heat over medium high for about 7 minutes. Test the oil by dropping in a pinch of cornstarch—if it bubbles immediately, you are ready to fry. You can also insert a candy thermometer into the oil—once it registers 350, you are ready to fry. Working only one piece at a time, pull one piece of fu from the broth and squeeze it gently to remove some of the moisture. Next, dip it into the Ener-G slurry, then coat in the cornstarch mixture, tapping off any extra. Gently place into the hot oil and fry until barely golden brown, about 4 minutes, flipping it over once or twice to ensure even frying. Remove and place on paper towels to drain. Repeat the process with the other 3 pieces. It’s important to batter the fu only one piece at a time; otherwise, the batter will start to soak into the fu, and it will become soggy. 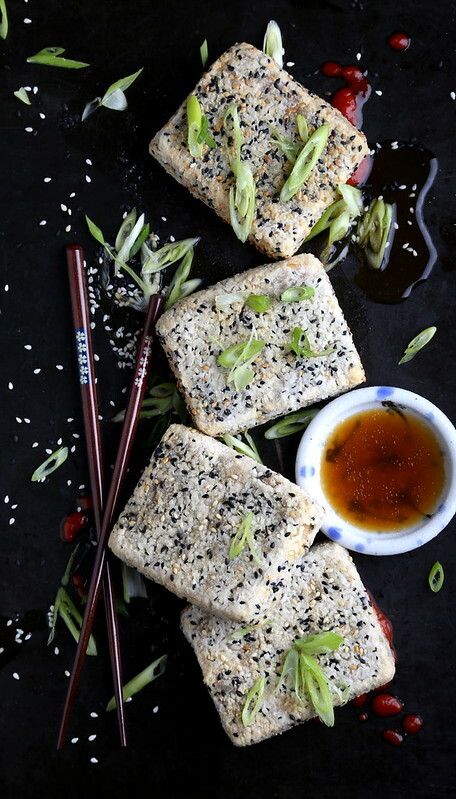 Whisk the leftover fu both, soy sauce, sesame oil, vinegar and agave together to make the sauce. Serve immediately with sauteed bok choy, broccoli or collard greens. So beautiful! I am intrigued! I think I've encountered fu before but wasn't vegan at the time so didn't really investigate it more. I will have to hunt some down! Thank you for sharing this!